I've covered how to write a killer Tweet, and how to create a killer blog post. After reading @RossCoops31's new post: Why Your Tech-Obsessed Conference Presentation Stinks—and How to Make It Better, I realized it was time to write how to give a killer presentation. Let's start with tips from Ross's post. He has great ideas like: Don’t just explain how to use tech, but rather how you use it in the classroom. Don’t forget to share information on standards alignment, assessment because most every teacher has to do it. And, finally, remember to give a hat tip to your fab PLN. If you have a chance, check out the full article with all the helpful details. If you wish your students were more engaged, then read on to discover more ways you can improve presentations. Make them interactive by using techniques such as peer instruction for learning about a concept; frame, focus, and follow up when using video; turn and talk with a random number generator, or share and receive images from the whole audience with Flickr. This handy tip about how embedding timers with YouTube so your presentation feels like a game show, is also helpful. Read this post to learn more 5 Ideas to Make Presentations Interactive. It’s also important to identify do’s and don’ts such as knowing your slides should show with images not tell with bullets. Don’t assume your presentation will be good, instead videotape yourself so you can reflect on what works and what you might want to change. Don’t read notes off paper, you should know what you are going to say and sound conversational. You can learn more dos and don’ts here. Presenting isn’t just important for teachers. It’s important for students too. Check out how you can ensure your students aren’t doing bad presentations with tips like, make sure they’re facing the audience and not the board, ditch the bullets. 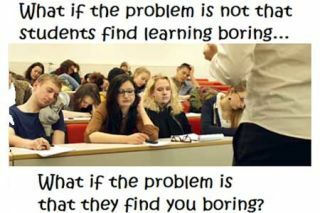 Find out other ways to help your students by reading Stop Letting Good Students Do Bad Presentations. And, if you only read one article, do yourself a favor and read about the One mistake presenters should never make and 8 strategies to avoid it. Your audience will thank you.